How strong is the Force! THIS strong! Back in 1977 I graduated from college and went on the interview circuit looking for a music teaching job. I finally was hired by a district 15 miles from the town I was from, but in between I covered a lot of ground throughout the Midwest. In June of that year I was in some little town in western Wisconsin that I have forgotten the name of…my brother Greg had traveled with me on that interview trip. We had the evening before the interview to kill so we drove downtown to the local one-screen movie theater. They were showing this science fiction movie that had turned into a big success. Even in mid-June the line to get in that night was around the block – and the movie had come out almost a month earlier! We liked it, but we both thought it was a little hokey. I was a hard science fiction kind of guy, reading Larry Niven, Robert Heinlein, Jerry Pournelle, those sorts of guys. This was pretty “space opera” for me…come to think of it, I don’t think that term had even existed yet then. If it did, I hadn’t heard it. The film grew on me, as it did on millions of others. So, of course, as soon as my kids were old enough they were indoctrinated into the ways of the Force. We took my daughter to see “Empire” when it came out…she immediately identified Yoda as “Fozzie Bear” – good ears, kid! My son came along in 1981 and had to play catch-up a little bit. Fortunately, after the first movie came out in 1977 the whole saga never really went away. There were blips up and down over the years when it was more culturally prominent, but it was always there. I actually took a personal day off work to go see “The Phantom Menace” with my son! And yes, I’m one of those few who likes JarJar. And I have that giant, three-foot Millennium Falcon toy. So…once the online gaming started I was too old for that. Too many things intervened and I never was into gaming much. My son Brian, though, that was different. I couldn’t tell you exactly what online games he has been involved in except for World of Warcraft. Now, apparently, he is involved in something called Star Wars The Old Republic. So…when it came time that Brian wanted to propose to his girlfriend of three years, Amanda, he did it at the SWTOR Summit in Austin, Texas. Yeah. And the guys who wrote the game helped set it up. Stormtroopers, R2-D2, the works. Just as George Lucas had no idea back in 1977 where Star Wars would take him, I had no idea where it would take my family. Dang. By the time we get to the Republican Presidential primaries we’re going to be down to this guy. As far as we know, he has had no affairs, he doesn’t have any corruption issues from holding a previous office, and as far as I can tell, he never was particularly interested in socialized medicine. That is, assuming Vader is a Republican. If he is, I guess he’s a big-government conservative, right? I mean, he was working for the Empire, after all. He has that intolerance of failure that liberals like to accuse conservatives of. I don’t know where he stands on taxes and on the budget deficit. 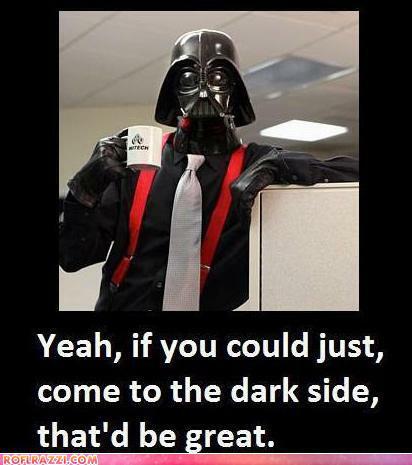 He certainly has some ideas on full employment – learn the Power of the Dark Side, submit to the Emperor, or die. That’s simple. Same policy for immigration, I think. There was that one incident of nepotism, of course. It didn’t turn out so well. His son was kind of a whiner, anyway. That’s why you can’t hire relatives, I guess. You know, now that I think of it, Vader might have leanings more toward the Democrat party. He seems comfortable with a large bureaucracy – but then again, he was known for removing executives for small infractions of policy. Or were they really military? In the Empire, it’s hard to tell. 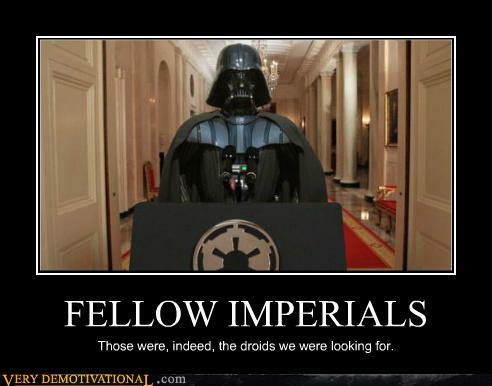 I know this: no one would ever accuse Darth Vader of being libertarian. I, for one, welcome our new overlords from the Empire. An artist going by the name of Clave has done twelve pages – over a hundred individual images – of beautiful profiles of aircraft and spacecraft, repainted in livery that they would never historically have, like an F-22 of the Soviet Air Force, etc. 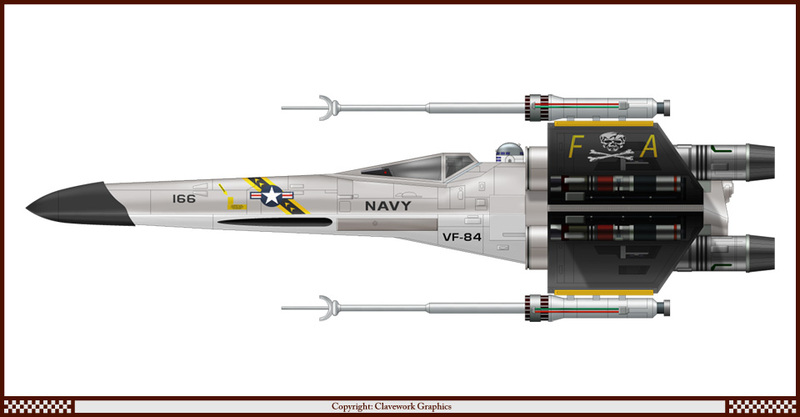 The majority are aircraft, mainly WWI and current jet aircraft, but some are TV/film spacecraft like the Gerry Anderson Thunderbirds ships and the Battlestar Galactica Viper. I hope he doesn’t mind me posting this one example. Go to these pages to find the others. Even if you are not a fan of aircraft, science fiction, or alternate history, you will enjoy the sheer artistry in his work. He is an incredible craftsman. Rarely have I seen so much beautiful, exacting imagery of such high quality and with such interesting ideas! Um, yeah, I guess you’ll come in to work on Saturday, right? I can’t stream it here, unfortunately. You’ll have to follow this link. Yeah, they really were outmanned and outgunned…and trust a smuggler like Han Solo?